Physical changes, including the foods our bodies require and how those foods are processed, is a part of the natural aging process. Metabolism slows and seniors will become less physically active as they age. To avoid weight gain (and the health risks associated with it, such as heart disease and diabetes), older folks need to pay special attention to health eating and exercise. 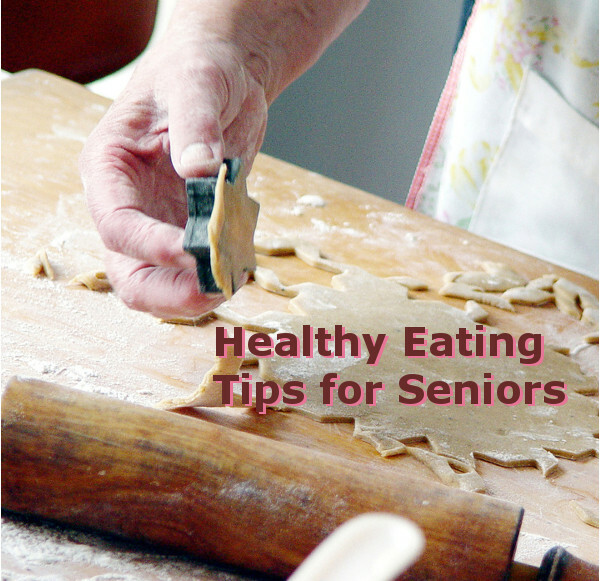 Seniors will lose sensitivity to tastes, with salty and bitter being the first to be affected. Instead of salt, use herbs, spices, and olive oil to add tasty flavors to food. Health problems or medications can affect the sense of taste. If this occurs, seniors should talk with their doctor. Aging slows digestion because the amount of saliva and stomach acid produced decreases. This can lead to difficulties with the body processing certain nutrients. Increased fiber intake helps. Know what a healthy plate looks like – ½ of our plate should be filled with vegetables, especially the green, leafy ones! ¼ of our plate should be filled with fiber-rich grains and the final ¼ of our plate should be filled with a protein such as eggs, beans, fish, or meat. Select foods high in fiber and low in salt and sugar – Be sure to include lots of high-fiber choices such as nuts, beans, and whole grains. Decrease the intake of sodium (salt), which can contribute to heart and vascular disease, and sugar, which can lead to weight gain and lower energy levels, while causing spikes in blood sugar levels. Choose fresh foods – Whole foods such as fresh produce, meats, and dairy, are the healthiest. When you choose packaged foods, read the labels and shop smartly. Look for low-fat, low-sugar, no-salt, and whole-grain options. Stay hydrated – Seniors are susceptible to dehydration, so drinking small amounts of fluids consistently throughout the day is important. Tea and coffee in moderation are acceptable, but water and juice are key to offsetting dehydration. The food services director at Red Bud Assisted Living works hard to ensure that residents are provided with nutritious and delicious dining choices, through a variety of menu items, including healthy snacks. The caretakers help our residents stay hydrated by providing beverages throughout the day. If your loved one is unable to shop or prepare nutritious meals for her/himself, it may be time to consider an assisted living center. Download our brochure, "Is It Time for Assisted Living?"